Does anyone know the name of a particular bag from (I think the spring 2004 or Fall 2005) collection that kind of resembles the Stella but has buckles on each side of the bag which can shorten or lengthen the bag? 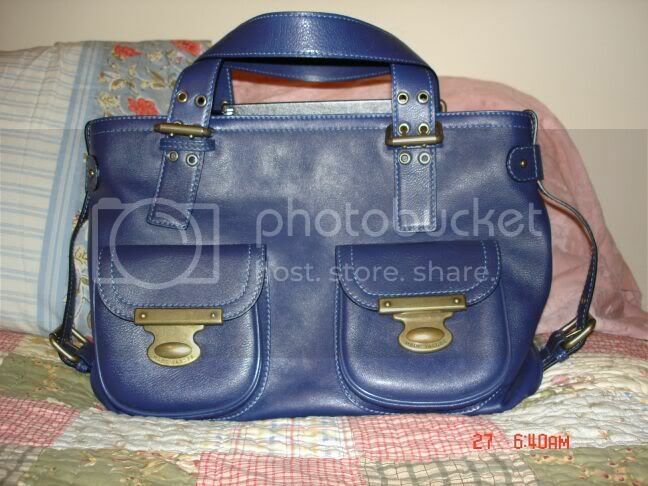 Heh, that drummed satchel looks remarkably like the adina, so maybe what you're looking for is one of those two? I believe that you are talking about a Marc Jacobs Quinn bag. Hi, I'm new here. Is this the bag you mean? Sorry about the text link, but I don't know how to post pics yet! . Anyway, I bought that one last year from eLuxury, but I don't think they listed a name. Yep, I just checked my email confirmation from eLuxury and just like I remembered, they only listed it as "Vegetable-tanned Tote." Maybe someone else out there can help us both out! yes that is the one - I guess it is called Quinn - thanks for the help!!! Harley, I got that bag from eLuxury last year too. I believe it was just called the "New Tote." The Quinn is a much smaller shoulder bag. Are you sure you don't mean the MJ Sophia? The Sophia is identical to the Stella, except it's smaller and has a single long shoulder strap. I'm attaching an image of my Sophia (never posted a pic so it might not work) so you can see what I mean. This bag is a limited reproduction of the original Sophia design and is still available at Bergdorfs and Neimans in black and white (the newer versions have push locks on the pockets). MJ is no longer making Sophias. Are you sure you don't mean the MJ Sophia? The Sophia is identical to the Stella, except it's smaller and has a single long shoulder strap. Nope. The Sophia has three compartments, two zipper, one magnetic snap, whereas the Stella, and the New Tote only have one big zipper compartment. The Quinn is just like the Cammie, but with those new style pushlocks. Yup the Quinn is my bag ..